About 140 votes shy of the 50 percent plus one votes needed for an outright victory, incumbent City Councilman Gil Cedillo likely will have to face his challenger, Joe Bray-Ali, in a May runoff for his First Council District seat following final vote results released today. According to the new figures, Cedillo’s vote count fell to 49.34 percent, with Bray-Ali coming in second with 37.97 percent. The results will not be certified until Tuesday, but with 100 percent of all precincts counted and the tally of the vote-by-mail and provisional votes completed, Cedillo had 10,396 votes in his column while Bray-Ali finished with 8,000 votes. Any registered voter can ask for a recount, if he or she is willing to pay for it, within five days of the certification. The fee varies based on how many people are needed for the recount, but can range from $5,054 to $21,158 per day. Cedillo finished the March 7 election with 50.98 percent of the vote and a March 10 update saw him increase his lead to 51.28 percent. Another update released last Tuesday, however, showed his lead drop below 50 percent, and it stayed below 50 percent in an update on Friday. A runoff election would be held on May 16. The city of Los Angeles’100-year-old Southwest Museum was named a “national treasure” today by the National Trust for Historic Preservation. The announcement was made at the museum’s Mount Washington location, making it one of just 55 such designations across the country. What the designation means for the Southwest Museum in practical terms is not yet clear, however, it will open the door to valuable resources and alliances that could aid in securing the museum’s future, and most importantly, its long term financial sustainability. The National Trust for Historic Preservation — one of the nation’s leading private historic preservation groups — said today it plans to hold public outreach meetings to gather opinions on how best to use the museum site. The Southwest Museum has been at the center of a near decade long feud between museum supporters and the Autry National Center of the American West, which took over management of the financially failing museum in 2003 as part of a merger agreement. 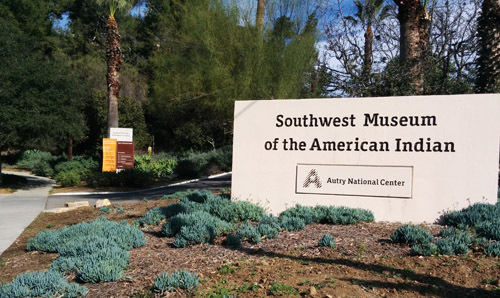 Southwest supporters say the Autry has not lived up to its “promise” to restore the facility so it could continue to operate as a fully functioning museum. According to the Autry, they have invested over $14 million since taking over. Two-thirds of the investment has gone to conserving the Southwest’s extensive collection of Native American and early California artifacts and art – which has been removed from the site – and the remainder to renovations to stabilize the museum structure. But they say they cannot afford to operate the museum or pay the estimated $26 to $46 million cost to upgrade the Southwest to modern museum standards. Friends of the Southwest Museum, a coalition of individuals and organizations that has tried for years to pressure the Autry – and city officials – to reopen the museum, has long contended that the value of the Southwest’s collections could provide a path to securing the revenue needed for operating the historic facility, but that the Autry has been more interested in using the collections to bolster its status and to build patronage of its Griffith Park campus. The museum has been mostly closed since 2006, only opening for a few hours on Saturdays, to the ire of many museum supporters. A recent community-based survey showed overwhelming support for a fully functioning museum at the Mt. Washington site, and possibly a cultural community center with some commercial elements, such as a restaurant. The National Trust says it plans to hold public outreach meetings to gather opinions on how best to use the museum site and its collection. Barbara Pah, Western Regional VP of the preservation group, said designating the museum site as a national treasure recognizes “the historic, architectural and cultural values that have made the Southwest Museum site a beloved fixture in Los Angeles for the past century. urban fabric of Los Angeles for the next 100 years,” Pahl said. The National Trust will take the lead on planning and mediating the tense relationship between community stakeholders and the Autry, and could pursue government and private grant funding to support the eventual consensus on the museum’s future. Councilman Gil Cedillo, who represents the area where the Southwest Museum is located, hailed the National Treasure designation. “I applaud the National Trust for naming the Southwest Museum, a National Treasure,” stated Cedillo in an email. 4:30 p.m. This article has been updated to note that the “national treasure” designation has been made; National Trust for Historic Preservation’s plans to hold public meetings; quotes and background information from the National Trust and the Autry. The City Council’s Economic Development Committee Tuesday withheld its support for a permitting program for mobile sidewalk vendors, with several members saying the proposal was not fully developed and calling for more study on how such a program would work. 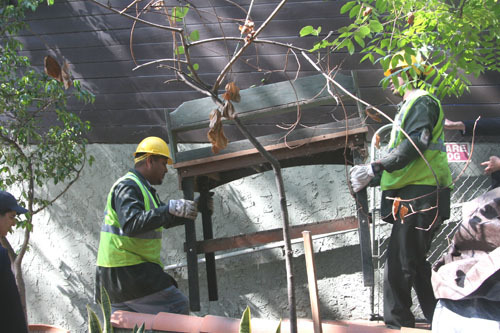 The proposal to legalize the sale of food and wares on sidewalks and public parks is being championed by Councilmen Curren Price and Jose Huizar, who is up for re-election in March. The committee meeting was preceded by a rally and news conference organized by the Los Angeles Street Vendors Campaign, in which vendors and speakers from the 55-member coalition prematurely called it an “historic” day in anticipation that the panel would greenlight the proposal and send it on to the full council. 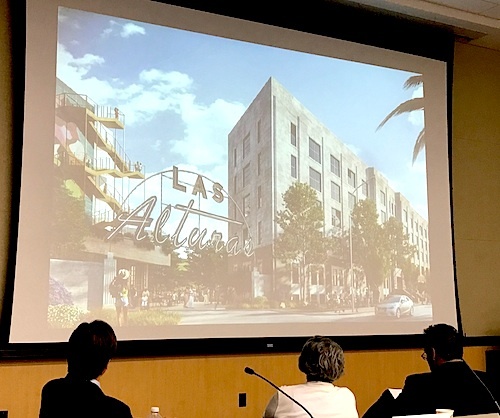 Koretz, along with Councilmen Paul Krekorian and Gil Cedillo, noted the thinness of a city report on the permitting proposal and said they felt as though they were being asked to support a program before key questions were answered. The council members said the report was short on details about the number of permits that would be available, the types of food or wares that could be sold, where vending could take place, permit fee amounts and whether there would be enough funding to enforce the regulation, among other issues. “What I have before me is seven pages of a report that doesn’t really even weigh some of the fundamental policy decisions we’re going to have to make as a council,” Krekorian said. 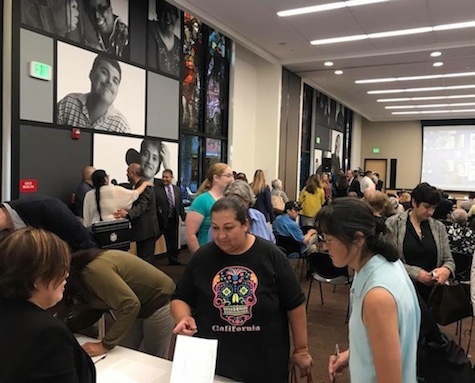 Huizar expressed bewilderment at the pushback from some business groups and fellow council members who criticized the lack of detail in the report, saying at least two meetings were held in recent months to obtain feedback from the public. “This motion was introduced a year ago, and I thought we would be much further ahead in understanding what this means,” he said. Some groups, representing businesses and neighborhood councils, urged the panel to consider allowing the permitting program in some areas, but not in others, depending on the individual needs and characteristics of each neighborhood. But groups that have been pushing for legalization of street vending said they want the program applied citywide. There are an estimated 10,000 food vendors and 40,000 non-food vendors doing business in Los Angeles on sidewalks and in parks, according to city officials. The report presented to the Economic Development Committee describes an organizational chart of what agencies would take part in the permitting program. Food vendors would need to obtain permits from the Department of Public Health, and the Los Angeles Police Department would play an enforcement role, city officials said. The Economic and Workforce Development Department, the Recreation and Parks Department and the Bureau of Street Services would handle the permitting process under the current framework. Supporters of legalizing street vending say it would open up entrepreneurial opportunities to low-income people and legitimize an already thriving street food culture in Los Angeles, while critics of the business model worry it would create a public nuisance and unsanitary conditions related to food sales. The proposal has drawn mixed reaction from neighborhood groups. The Studio City Neighborhood Council officially opposes the idea, while the Historic Highland Park Neighborhood Council, the Los Feliz Neighborhood Council and the Greater Echo Park Elysian Neighborhood Council have come out in support of legalized, regulated street vending. The Mar Vista Community Council expressed “deep concerns” about the proposed permitting system and asked that before street vending is legalized, issues such as liability, sanitation, noise, odors and trash be addressed. Some concerns were raised that street vendors would be more prone to extortion by gang members, but LAPD officials said brick-and-mortar shops could also be affected, noting the best way to combat that type of crime is to report it to authorities. 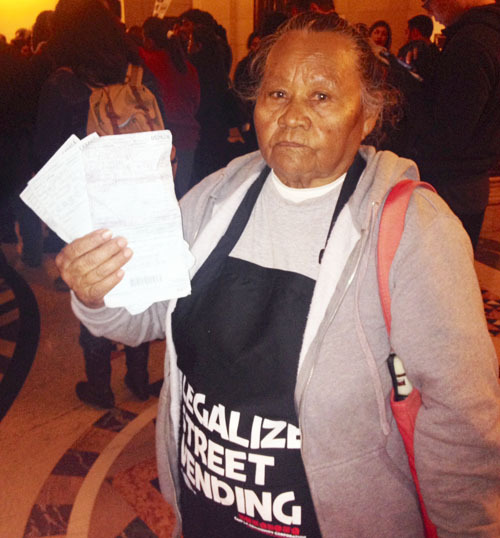 Holding a stack of tickets for illegal street vending, Rosa Calderon stood with a group of about 100 street vendors inside Los Angeles City Hall Tuesday—confident a city council committee was about to move forward a measure to allow them to go about their business legally. 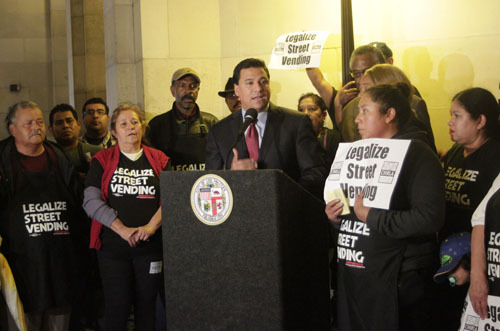 Their hopes were temporarily dashed when the City Council’s Economic Development Committee decided to delay action on a street vending permitting process championed by Councilmen Jose Huizar (CD-14) and Curren Price Jr. (CD-9). There is an estimated 50,000 street vendors in the city, but according to Huizar spokesman Rick Coca, the exact number is hard to come by because the industry is unregulated. Because street vending is currently banned, sellers are unable to pay for a business license or get a health permit, and are subject to fines if caught. Many street vendors are undocumented, elderly or unemployed and according to street vending advocates, they have no other options for making the money they need to live. This is the case for 85-year old Calderon, who told EGP she has been selling sodas and bottled water in downtown Los Angeles ever since losing her housekeeping job six years ago. She says her undocumented status and advanced age have made it impossible for her to find another job. Holding five tickets, some issued by the same police officer and each carrying a $300 or so fine, Calderon said she can’t afford to pay the tickets and has been doing community service to try to reduce the debt. She said street vending is her only option for paying her rent and her food. It’s a financial necessity, say street vending allies. “We want to be able to bring it into the light because it benefits everybody,” he said. Sixty-five-year-old Jose Moreno sells raspados (shaved ice) and elotes (corn on the cob) in the San Fernando Valley. He said vendors like him aren’t hurting anyone. “What we sell is not illegal, we are not hiding our stuff,” he said. But “when [the police] confiscate our merchandise they leave us with nothing,” he said. He said he felt helpless when police took away his cart with about $400 of merchandise. “They don’t understand that we have bills and rent to pay,” said Moreno, who turned to street vending after losing his job. Selling on the street is hard work and a tough way to make money and no one is getting rich doing it, say street vendors. “Unfortunately, it is a perception that street vendors take away businesses from store fronts,” Isela C. Gracian, Vice President of Operations with the East Los Angeles Community Corporation told EGP. “We have been working with different store front businesses and they see the value of working with street vendors to attract more clientele to their neighborhood,” said Gracian, hopeful the committee will get its answers and move forward soon on approving a permitting process. According to a research study by the Economic Roundtable, street vendors create and support an estimated 5,234 full-time jobs. Food vendors alone “create 1,896 jobs,” the study found. Un nuevo programa piloto para “cambiar drásticamente la forma en que la Ciudad recoge objetos voluminosos” comenzó la semana pasada en el Este y Noreste de Los Ángeles del Concejal Gil Cedillo, CD-1. En una conferencia de prensa, el 24 de abril en una casa en el área de Cypress Park/Mount Washington, Cedillo anunció que la ciudad está explorando los beneficios de permitir al departamento de trabajadores de recolección de basura se lleven mueblería vieja, electrodomésticos y otros objetos voluminosos desde el interior de las casas de los residentes, y no solo en la acera como se hace actualmente. El programa de 6 meses ofrecerá 10 locaciones de recolección por día—Lunes a viernes—a los residentes del Primer Distrito, dijo Cedillo. Se permitirá un máximo de cinco artículos por hogar. Se requiere hacer cita y estas serán en base de “primer llegado, primer servido”, dijo Alex E. Helou, asistente director del Departamento de Recolección de Basura de la Ciudad de Los Ángeles. 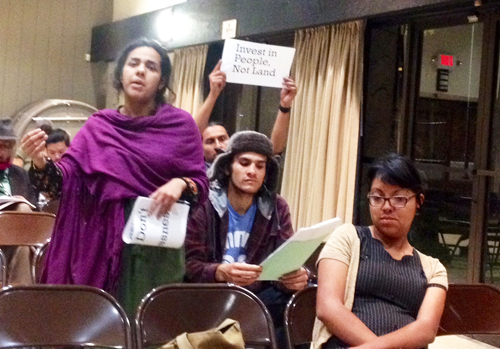 Desde su comienzo en el Distrito, Cedillo ha centrado muchos de los recursos de su oficina en la lucha contra la basura y problemas de deshechos ilegales en el distrito que incluye Highland Park, Lincoln Heights , Chinatown, Echo Park, Westlake, MacArthur Park y la región Mid-Cities entre otros vecindarios. Este último esfuerzo es una expansión en su Distrito de la “campaña de limpieza” que incluye todo, desde la basura selectiva y la eliminación de artículos voluminosos hasta compactadores de basura y anuncios recordando a los residentes que mantengan la ciudad limpia. Aunque los residentes actualmente pueden llamar al 3-1-1 para pedir a la ciudad se lleve objetos voluminosos como colchones y sofás , no todos llaman antes de dejar los objetos en las aceras, terrenos baldíos o en los callejones . Y para algunas personas los requisitos pueden no ser fáciles de cumplir. “[Tenemos] una norma en la que pediamos a nuestros residentes a poner sus objetos voluminosos fuera para recoger y me pareció inaceptable”, Cedillo le dijo a EGP. Los artículos pueden ser demasiado pesados para que algunos residentes los pongan a la calle, “así que hice una petición para cambiar eso para permitir [a los trabajadores] de recolección de basura para ir dentro de las casas de la gente”, dijo el concejal. Ellos “recogerán [los objetos voluminosos] como si son sus servicios de UPS o FEDEC”, excepto que este es un servicio pagado con los impuestos de los residentes, agregó. “Las personas pueden ser pobres , pero eso no quiere decir que quieren vivir en un lugar sucio”, explicó. Cedillo previamente le dijo a EGP que muchos de los programas que él ha comenzado están destinados a eliminar las ineficiencias burocráticas que complican el proceso de limpiar la basura y eliminar elementos, tales como un trabajador de la ciudad que sólo se lleva un colchón descartado y deja atrás un viejo neumático que esta en el mismo lugar, porque ese es el trabajo de otro departamento de la ciudad. Mientras tanto, Helou dijo que los residentes que deseen que la ciudad vaya a remover sus objetos del interior de sus hogares deben firmar un acuerdo de responsabilidad antes de que los trabajadores puedan entrar. Lo ideal sería que el residente este en casa cuando los trabajadores de sanidad lleguen, pero si no puede estar ahí, Helou dijo que pueden dejar objetos en el porche con una nota que identifique claramente qué cosas han de ser recogidas para evitar que se lleven los elementos equivocados. La persona que pide el servicio y que este en casa cuando los trabajadores lleguen debe ser mayor de 18 años. No más de cinco elementos se eliminarán por hogar, y todos los artículos deben estar libres de ataduras y no estar en paredes u otras superficies; los aparatos deben desconectarse de las tuberías de gas o electricidad y los artículos deben caber fácilmente a través de la puerta de salida. La ciudad no se hace responsable por los daños a los elementos retirados, y una vez fuera de la propiedad no se pueden devolver. El programa piloto será evaluado después del período de prueba de 6 meses, según Helou. Si tiene éxito, “la mantendremos y ampliaremos a más distritos del consejo y en toda la ciudad”, agregó. Los residentes pueden llamar al (800) 773-2489 24 horas antes para programar el servicio y habrá una ventana de colección de cuatro horas el día de recolección. Las comunidades en CD-1 son Glassell Park, Cypress Park, Highland Park, Mt. Washington, Solano Canyon, Elysian Park, Echo Park, Westlake, Angelino Heights, Temple Beaudry, Lafayette Park, Chinatown, Forgotten Edge, Lincoln Heights, Montecito Heights, Sycamore Grove, Pico Union, Adams-Normandie, University Park, Mid Cities and Mac Arthur Park.